NOAQ is now growing fast. Sales are increasing and the number of distributors has doubled during the last 12 months. NOAQ is now represented in more than 30 countries. 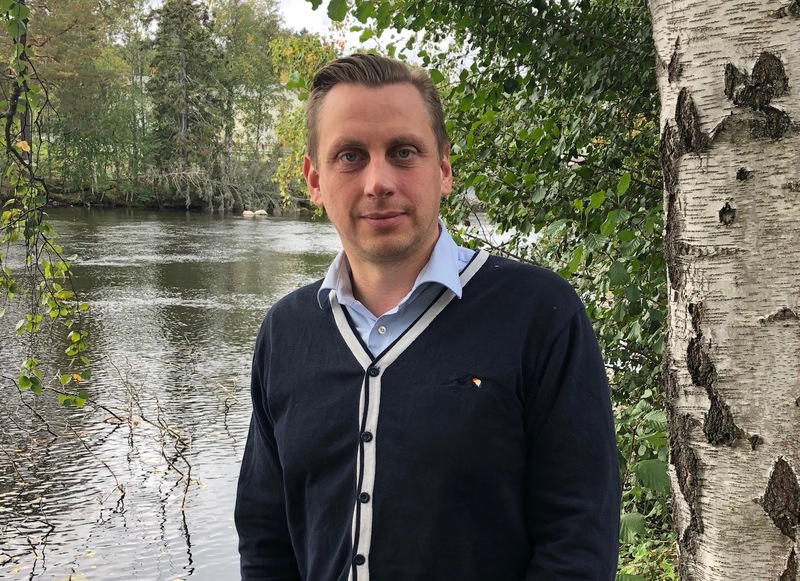 We have therefore recruited an International Sales Manager, Thomas Brunzell from Hudiksvall. Thomas comes directly from a corresponding position in Senseair AB in nearby Delsbo. The development of our new Boxwall model BW52 is now finished, and the product is ready for delivery. The new box is built on the design of the current box BW50, and has the same damming capacity as that one, but there are a number of differences. Most obvious is that the new box is 44% longer than the old one, 90 cm instead of 62. This means that fewer boxes are needed to make a flood barrier, and that the speed of deployment increases. The BW52 is fully compatible with the BW50, which means our customers can continue to build on the same system. With the introduction of the new box we also get a much higher production capacity, something that is very important because of the rapidly growing sales. New NOAQ distributors are added continuously. During the latest months we have signed distribution agreements with companies in China, South Korea, Holland, Czech Republic, Georgia and Mauritius. This means NOAQ is now represented in 30 countries. NOAQ is back in Germany and Canada, but represented by new distributors. In Germany Fritz Raschel Feuerschutz GmbH, a company specialized in products for the emergency services, in Canada it is a brand new company. Wayne Fernandes needed to protect his own home and found NOAQ’s products on the web. When he realised we had no Canadian distributor he registered a new company, DAM-IT Canada, and now it is up running. During the latest months NOAQ has signed distribution agreements with three more companies, covering five markets, Thai Wiring for Thailand and Cambodia, Zaxco for Malaysia and Singapore and Prescience Consulting for Trinidad och Tobago. Now the NOAQ products can be found in 25 countries. October 27, 2017 … plus Turkey, Hong Kong and Spain. NOAQ has now signed agreements with three more distributors, Yena Celik for Turkey, Aten (HK) for Hong Kong and Rescate y Emergencia (REMER) for Spain. All distributors and their contact information can be found under Distributors. The spreading of the boxwall video on Internet during the summer has lead to an enormous interest for the NOAQ products. Requests for distribution has come from all over the world, and agreements have so far been signed with four companies, Growag in Switzerland, Ignidon in Belgium, Drammen Flomsikring in Norway and Sitrol in Chile. A video showing how a NOAQ Boxwall can be used to divert water torrents in flash floods has spread virally on the Internet. It was published in May by NOAQ’s Australian distributor Bluemont and has since appeared in a number of new versions. One of them can be seen here. It has now been viewed more than 20 million times. 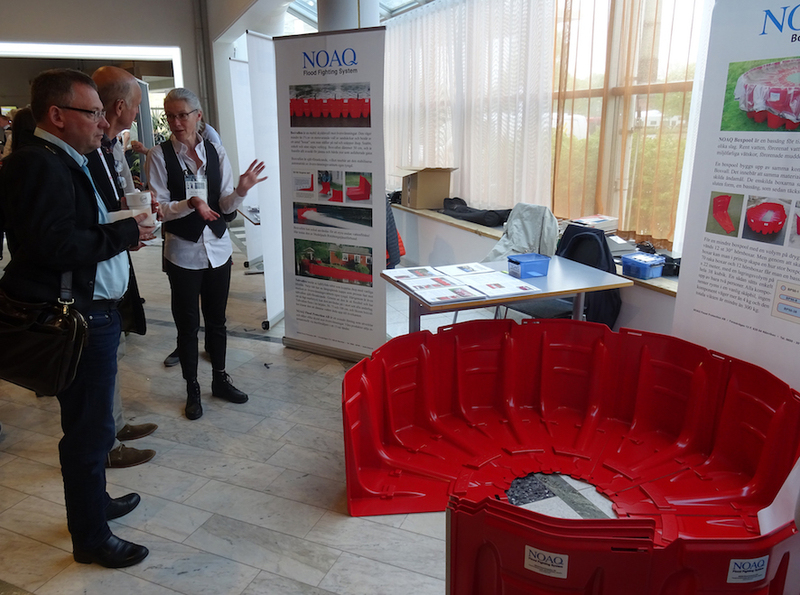 Now the new NOAQ Boxpool has been introduced to the Swedish fire chiefs, at the conference Brand 2017 in Linköping (“Brand” is Swedish for “Fire”). 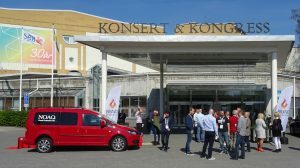 There was good interest and hopefully most Swedish fire services will get it. 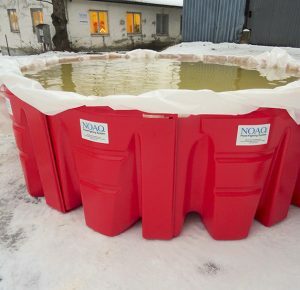 The Boxpool is in fact a vessel for the temporary containment of all kinds of liquids, but if you need to defend yourself against flooding the building material can be used for this purpose as well. The components for a 38 cubic metre boxpool can instead be assembled to form a 40 metre long temporary flood barrier. NOAQ will participate in the conference “Brand 2017” in Linköping, Sweden, on 16 – 18 May. We will exhibit our two sibling products, the Boxwall and the Boxpool. 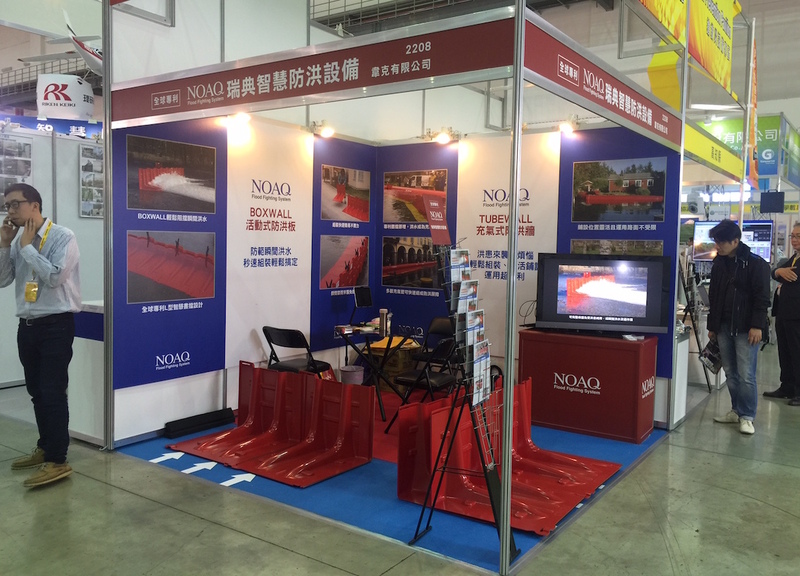 Welcome to visit our stand! For those planning to purchase or procure mobile flood barriers we have put together a check list. Which criteria are relevant, and what requirements can be set? View the list here. NOAQ is now launching a new product, the Boxpool. It is a temporary basin for storing liquids of different kinds. 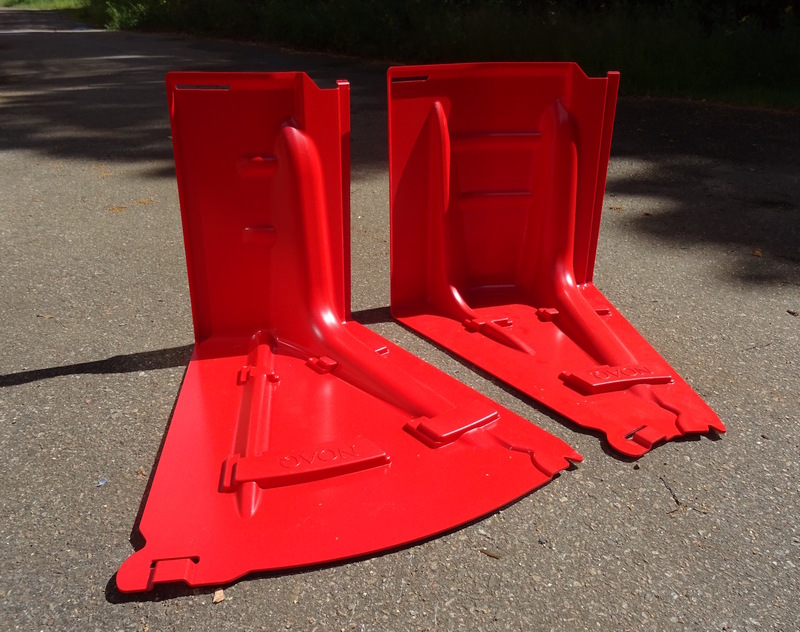 It has been named Boxpool as it is a close relative to the Boxwall, our mobile flood barrier. A Boxpool is built up by the same components as the Boxwall, but instead of assembling them in a long row, they are connected to form a circle. Or whatever shape desired. The smallest Boxpool contains a little more than a cubic metre (35 cubic ft) while the biggest one can take 38 cubic metres (1,340 cubic ft). The Boxpool is primarily targeting the needs of the emergency services, for temporary disposal of contaminated water or hazardous liquids, but it can of course also be used as a temporary bathing pool, in any format. Flood Resolutions LLC in Boise, Idaho, becomes NOAQ distributor in USA. – We are extremely excited about the NOAQ product line! says Keith Anderson with Flood Resolutions. For starters, there is no product on the market like the Boxwall product. We are so excited about the ability to offer a flood barrier that can redirect water while it is moving without having to deal with fill material whether it be water or soil. That is an amazing product! – Additionally, the simplicity and ease of constructing the Tubewall product make it one of the simplest and most economical products on the market! We are very excited to represent the NOAQ product line. 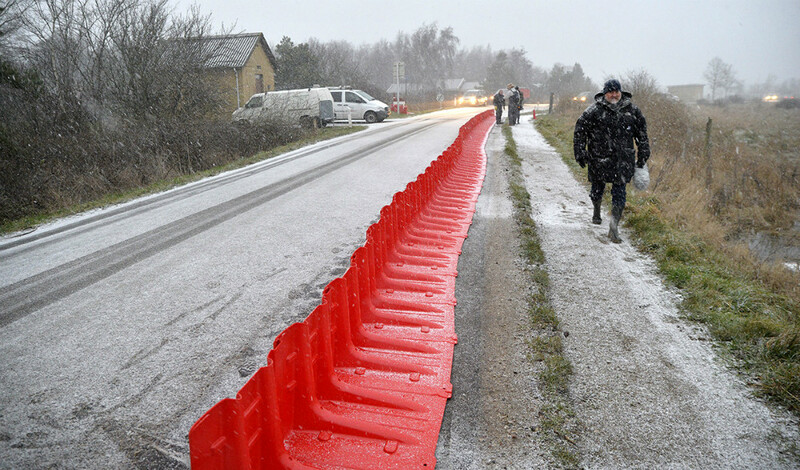 The 300 meter of Boxvall bought in December by the Danish fishing village of Reersø came into use immediately when a winter storm unexpectedly struck Denmark and southern Sweden. The purpose of the barrier is to secure the road to the village from storm surges. At the same time NOAQs Danish reseller Dansk Fugtstop was busy protecting a newly built villa in Solrød south of Copenhagen with Tubewalls and Boxwalls. 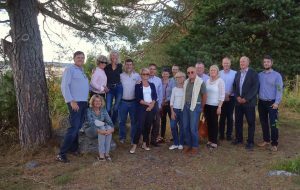 – We have so far almost exclusively exported our products, says Sigurd Melin on NOAQ, but after the flooding problems in southern Sweden it may be time to market our products also at home. 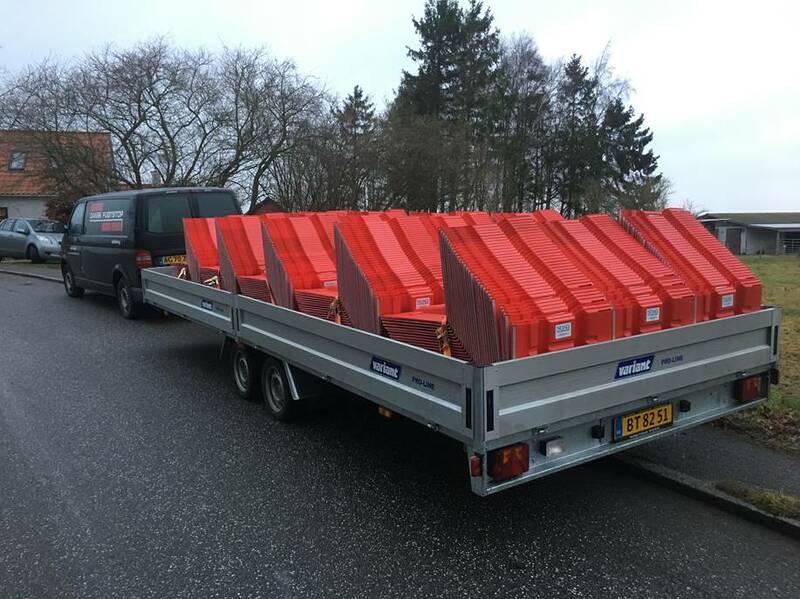 Here comes 300 metres of boxwall on their way to Reersø in Denmark. Normally the boxes are delivered on pallets, but as manufacturing take place in the southernmost part of Sweden our Danish distributor Dansk Fugtstop decided to go to the factory himself and bring back all 500 boxes on a giant trailer. NOAQ’s British distributor Flood Control International has got an order for a little more than 900 meter of boxwall from the supermarket chain Sainsbury’s. 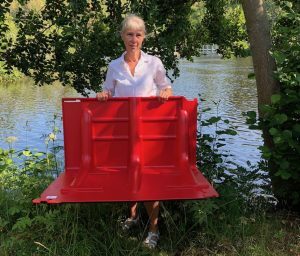 The boxes will be stored on different locations all over the country, to quickly be brought to shops when there is an imminent risk of flooding. NOAQ has signed a distributorship agreement with Bratislava based ATECA. ATECA sells products for fire protection and rescue services and is representing a number of well known brands like Bauer, Lukas, Vetter and Flir. Read more on the company’s web site www.ateca.sk. NOAQ has delivered 550 meters of flood barriers to Italy. 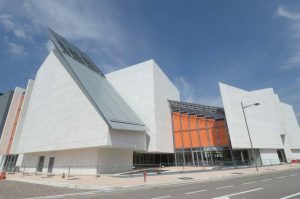 It is the new university library in Trento that shall be protected against future flooding with a combination of tubewall and boxwall. We have now had our second international Reseller Meeting, with representatives from Britain, Ireland, Denmark, Italy and Austria. In sunny and warm late summer weather, with no risk of flooding. We are now launching a corner box for outward corners, as a complement to the inward corner box we introduced in spring. All our boxes fit one another, and with the right combination of outward, inward and straight boxes a continuous boxwall can be drawn through areas where the space is limited by obstacles like poles, walls and trees. The new outward corner box also makes it easier to encircle and protect small objects. Each corner box provides an angle of 30°, so by connecting 12 corner boxes, plus a number of straight ones, an area of any size and form can be protected. NOAQ has signed a distributorship agreement with Vikoma International for the British market. This means we have now two UK distributors. Vikoma has been manufacturing and supplying booms and oil spill equipment for nearly 50 years. – Our focus has been on the oil spill market, however booms are multipurpose and have been used for many applications including flood, jelly fish protection and debris, says MD Karen Lucas. 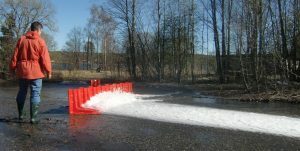 – We are pleased to partner with NOAQ as distributor for their flood defense products which complement the Vikoma solutions. – We select our business partners very carefully and are confident that NOAQ and Vikoma share common values and our commitment to quality, innovation and reliability, she says. Vikoma has also been given the right to distribute NOAQ’s products on the Hungarian market. NOAQ’s Australian distributor Bluemont showed a NOAQ boxwall at the 56th Floodplain Management Australia Conference in Nowra, NSW. 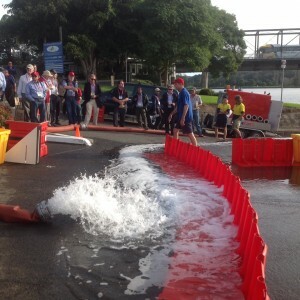 They demonstrated the boxwall’s ability to divert fast flowing water in a flash flood. At the Fire & Safety Trade Fair in Taipei 19-21 April NOAQ’s products were shown for the first time for a wider Taiwanese public. The interest was high as Taiwan is a country where hurricanes from the Pacific Ocean cause recurrent flooding. NOAQ has developed a corner component for the Boxwall system – i.e. a “corner box”. It has been given a 30° angle and is intended for inward corners. To create a 90° angle three corner boxes are connected in a row. 12 corner boxes make a circle, which can be used to create a small pool. Now our new website is up running. With responsive technology it adapts to any screen type or size. New colors and new design, but the same products. We also introduced the company on Facebook. Welcome to like us, follow us and share our postings with others! From 1 January NOAQ take over the Swedish domestic market from previous reseller Saveco, as the distributorship agreement runs out. – We want to have a direct contact with the wet reality, says CEO Sigurd Melin, and by taking care of the Swedish customers ourselves, and solve their problems, we will also get a feedback that will help us in our development work. The export sales, accounting for more than 95% of our turnover, is made through national distributors, which means we most often do not have the opportunity to have a direct contact with the end users. Slovenian TIERA/Vodastop becomes distributor för NOAQ in Slovenia and Croatia. The area suffers from recurrent flood problems, especially along the river Sava, which runs through both countries..
NOAQ has signed a distributorship agreement for the British market with Flood Control International in Tavistock, Devon. Flood Control International are already big in ”demountable” flood barriers, but will now be able to widen their portfolio to also include the best ”freestanding” flood barriers, the tubewall and the boxwall from NOAQ.